Our generic REST interface of JVx got an update. 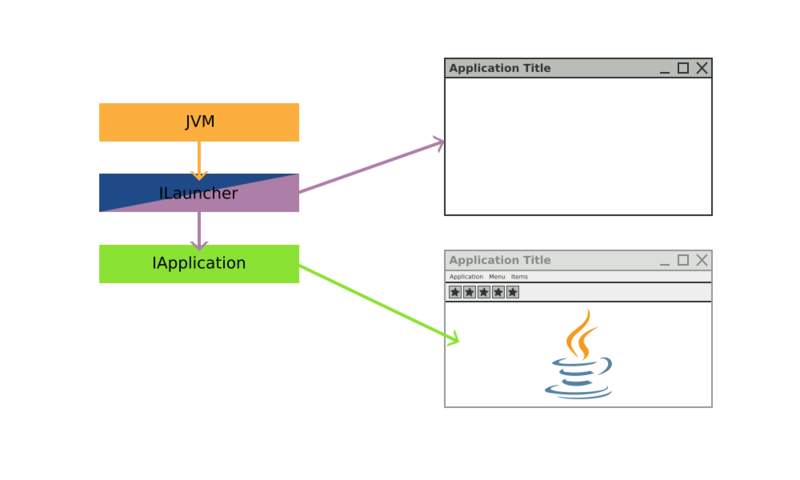 The REST services are a powerful feature of JVx and built-in. Usually you would implement your own REST services, but JVx has the concept of lifecycle objects and the powerful action mechanism. It would be ugly to implement another layer on top of JVx just for REST services. This is a framework feature. Our REST interface just works and you are able to create microservices very fast and efficient. The result type (IFileHandle) isn't a problem because JVx will send the bytes in the REST response, but the parameters: pFilter and pSort are specific types and not base types like String, Array, int, float. Still not hard to solve, but parsing the filter and sort definition weren't trivial tasks. In fact, it was annoying. We now have support for such parameters and much more. It's not super modern but an awesome solution! 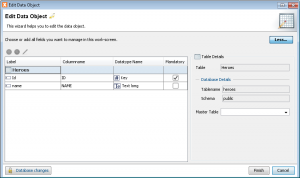 This method creates a CSV report (address data in this example). It has some parameters for the expected filename, optional column names which should be used for the report, optional labels for the column names, the filter condition and sort definition. The body contains Java Code (in the JSON string). JVx got support for executing simple Java code. We introduced the new utility class SimpleJavaSource. It's a backport from our commercial product VisionX. The SimpleJavaSource is able to execute the given parameters and creates real Java objects. It doesn't support conditions or loops, so it's really simple - but powerful! With our new SimpleJavaSource and the support for parameter Code, it'll be possible to call most methods without additional wrapper methods. 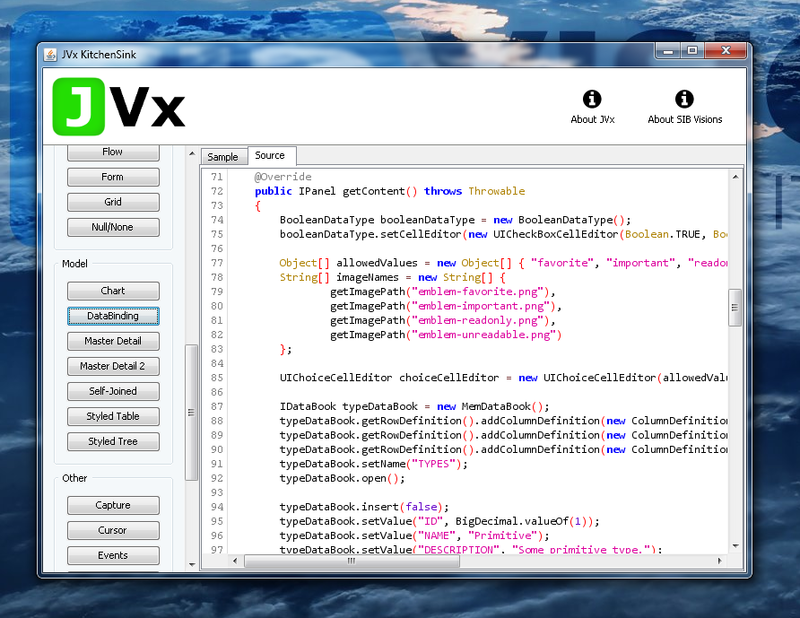 The new features will be available with our next JVx release and are already available via nightly builds. We've found the time to look at something that was floating around the office for quite some time. 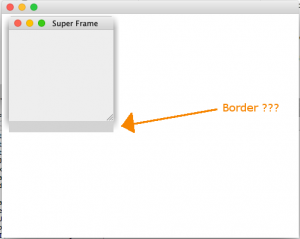 A few of us had previous experiences with Lua, a simple scripting language, but nothing too concrete and while doing a prototype a question popped up: Would it be easy to create a JVx GUI in Lua? As it turns out, the answer is "yes". Lua is a lightweight, multi-paradigm programming language designed primarily for embedded systems and clients. That is what Wikipedia has to say about Lua, but personally I like to think about it as "Basic done right", no insults intended. 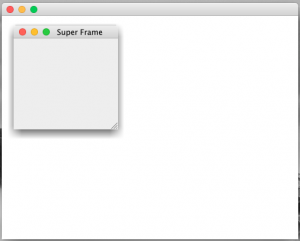 Lua is easy to write, easy to read and allows to quickly write and edit scripts. There are quite a few implementations for different languages and systems available which makes it very versatile and usable from in nearly every environment. But enough of the simple things, let's jump right to the case. JVx.Lua is a proof of concept Java/Lua bridge, which allows to use the JVx classes in Lua scripts. Additionally, we've created a short demo application, JVx.Lua Live, which allows to directly write Lua code and see the output live in the application. The example code should be self-explanatory and the API is as close to the Java one as is possible. If an exception is thrown by the Lua environment it will be displayed in the live preview. This allows to quickly test out the Lua bindings and create a simple GUI in no time. But note that this simple demo application does not store what you've created, when you close it, it will be gone. RSyntaxTextArea, a Swing component for displaying and editing code. LuaJ, a Lua interpreter and compiler which allows to compile Lua directly to Java bytecode. RSyntaxTextArea does not need to be further explained, it just works, and working very well it does. So does LuaJ, but that one has to be explained. To create a new "Lua environment" one has to instance a new set of Globals and install the Lua-to-Lua-Bytecode and Lua-Bytecode-to-Java-Bytecode compilers into it. And that's it! With this we can already execute Lua code directly in Java, and most importantly, at runtime. Which gives us all the power of Java at our fingertips in Lua. Create a LuaTable to hold the class and register it globally. Add all public static fields (constants) to it. Add all static methods to it. Add a single constructor with a vararg argument to it. The most interesting point is the constructor call, we simply register a method called "new" on the table and give it a vararg argument, which means that it can be called with any number of arguments. When this function is invoked the arguments are processed and a fitting constructor for the object is chosen. The found constructor is invoked and the created object is coerced to a Lua object, that created Lua object is returned. This allows us to use a clean syntax when it comes to accessing the static or instance state of the objects. Static methods and constants, including constructors, are always accessed using the "dot" notation, while everything related to the instance is accessed using the "colon" notation. With such a construct LuaJ had a hard time finding the correct overload to use even when listener was a coerced IRunnable. This turned out to be undefined behavior, because the order of methods returned by a class object during runtime is undefined, sometimes LuaJ would choose the correct method and all other times it would use the addListener(Object) method. Which had "interesting" side effects, obviously, because an IRunnable object ended up in a list which should only hold objects of type L.
We've added a workaround so that functions with no parameters can be easily used, but for "full blown listener" support we'd have to invest quite some time. Which we might do at some point, but currently this is alright for a proof of concept. Using Lua from Java is easy thanks to LuaJ, another possible option is Rembulan, which can not go unmentioned when one talks about Java and Lua. It does not only allow to quickly and easily write logic, but with the right bindings one can even create complete GUIs and applications in it and thanks to the ability to compile it directly to Java bytecode it is nearly as fast as the Java code. But, with the big upside that it can be easily changed at runtime, even by users. If you have a JVx application and want to use it without the frame border, it's not supported out-of-the-box. Sometimes it's very useful to have a full-screen application or to grab a screenshot without frame. The trick with FULLSCREEN is necessary because the event fires sometimes more than once. Simply press F12 key to toggle between Fullscreen/Frame mode. Let's talk about Resources and UIResources, and why they sound similar but are not the same. We've previously covered how the JVx GUI layer works, now we are going to have a better look at the Resources and UIResources. With "Resource" we do not mean images or similar, we mean the implementation at the technology layer which is encapsulated by a wrapper class (Bridge Pattern). 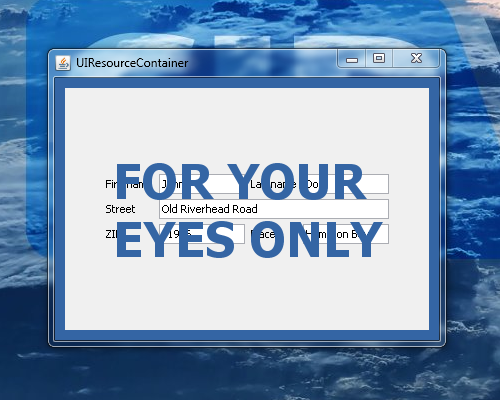 An "UIResource" on the other hand is an encapsulated concrete implementation of one of the interfaces on the UI layer. The UI Wrappers are the main UI classes which are used to create the GUI (f.e. UIButton). These are wrapping the Implementations (f.e. a SwingButton) which themselves are wrapping the Extension/Technology (f.e. a JVxButton/JButton). 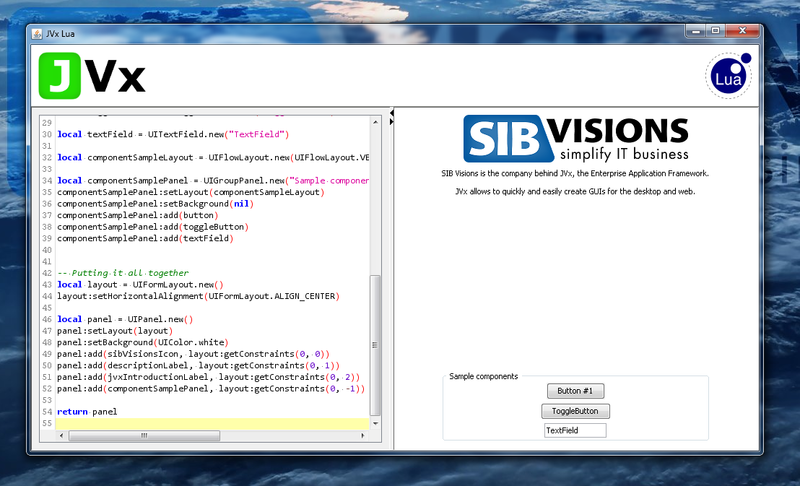 Only the UI and Implementation classes are implementing the interface required for the component (f.e. IButton). That also means that the Implementation is dependent on the Extension/Technology component, but the UI can use any object which implements the interface. 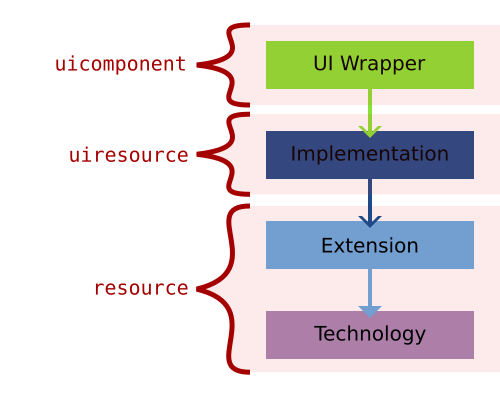 The resource itself, accessed by calling <uiwrapper>.getResource(), is the Extension/Technology component. 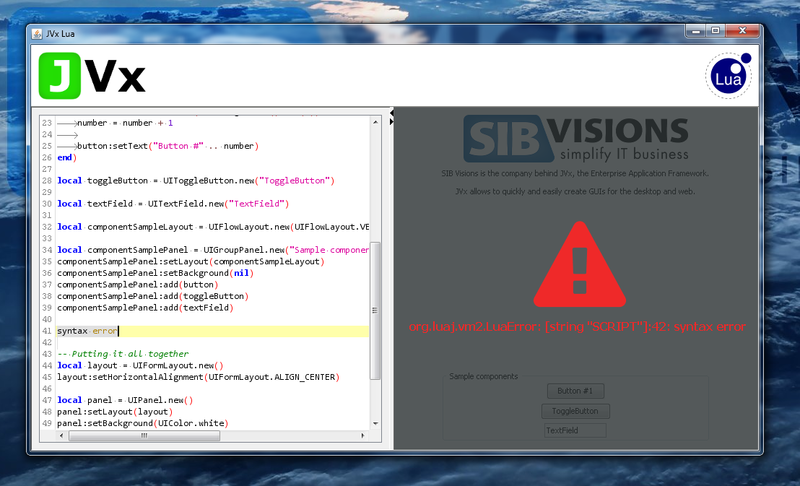 The uiresource can be accessed by calling <uiwrapper>.getUIResource(). The uicomponent can be accessed by calling <uiwrapper>.getUIComponent() and is usually the UI Wrapper itself. If we use our previous Swing example, the resource would be a JVxButton/JButton, the uiresource would be the SwingPanel and the uicomponent would be the UIButton. 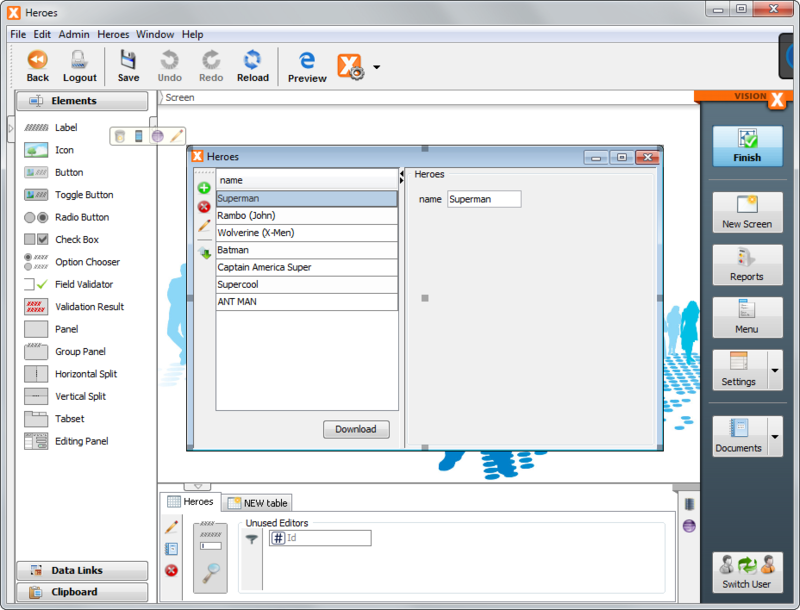 As one can see, access to all objects which are comprising the GUI is at all times possible. We, of course, have the UI component, we can access the Implementation component and we can access the Extension/Technology component. Theoretically we could also swap them at runtime, but in JVx this is limited to the construction of the object to greatly reduce the error potential. We are setting a new UIResource (an UIPanel) in the constructor (at line #5) which is to be used by the UIComponent. In this case it is not an Implementation, but another UI component, but that doesn't matter because the UIResource only must implement the expected interface. At line #15 we start using that custom UIResource. Because UIComponent is an abstract component designed for exactly this usage, the example might not be the most exciting one, but it clearly illustrates the mechanic. Also from the previous guide on how to create custom components we can reuse the PostfixedLabel as example. Now testLabel will be using the PostfixedLabel internally, but with no indication to the user of the object that this is the case. This allows to extend the functionality of a component completely transparently, especially in combination with functions which do return an UIComponent and similar. 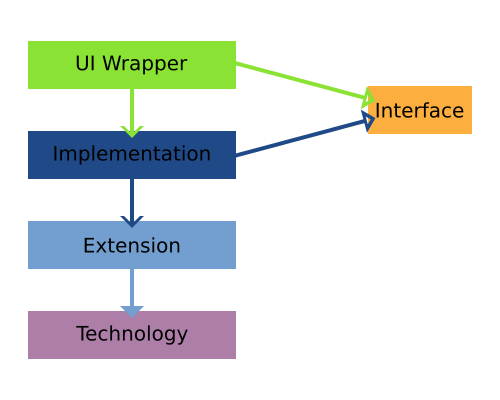 That is because such extended components are not "passed" to the Technology, they do only exist on the UI layer because they do not have a Technology component which could be used. That is done by adding the UIComponent to the UI parent, but for adding the actual Technology component the set UIResource is used. Another special case are containers. For example we could create a panel which does display an overlay in certain situations and we will need to use that throughout the whole application. Which is easy enough, but let's say we'd like to add logic to that wrapper, at that point it becomes more complicated. We can't use the same technique as for custom component from above, because in that case the "overlaying panel" would simply not be displayed. However, there is a similar mechanism for containers, setting the UIResourceContainer. What we've done is extend an UIPanel (line #1), setting it up and adding children and then we've declared one of its children as the UIResourceContainer (line #22). So all methods which are specific to IContainer (adding children, setting a layout, etc.) are now forwarding to the innerPanel and manipulating the contents of the OverlayedPanel directly is not directly available. This makes it very easy to have containers which add additional components without the actual GUI noticing or caring. 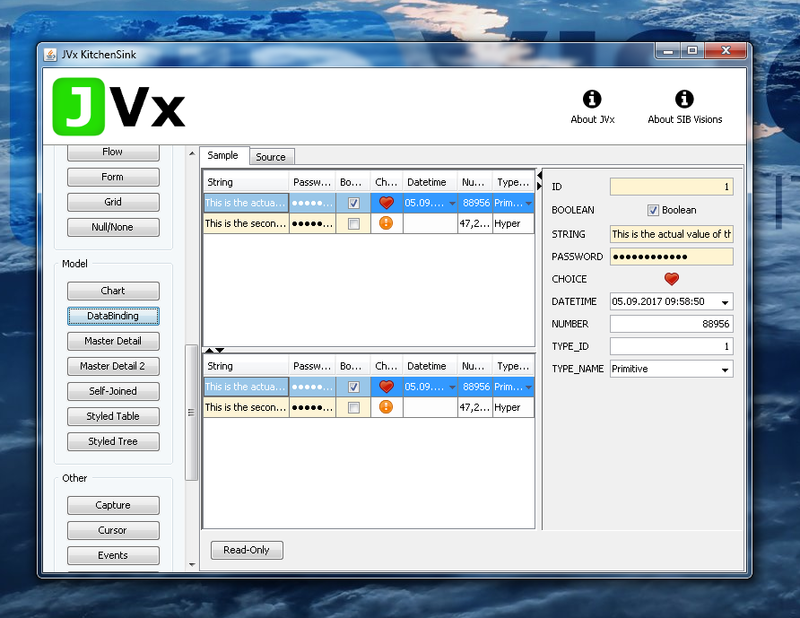 Because of the way the JVx framework is designed, it is easy to access all layers of the GUI framework and also facilitate the usage of these layers to create custom components and allow easy access to the wrapped components, no matter on what layer or of what kind they are.